The summaries of games 1 and 2/3 (combined) are reflective of dramatic game changing homeruns, epic last innings, and questionable decisions by the managers and umpires. These fan numbers support the social media trend throughout the world that the biggest major sporting events drive the most traffic. 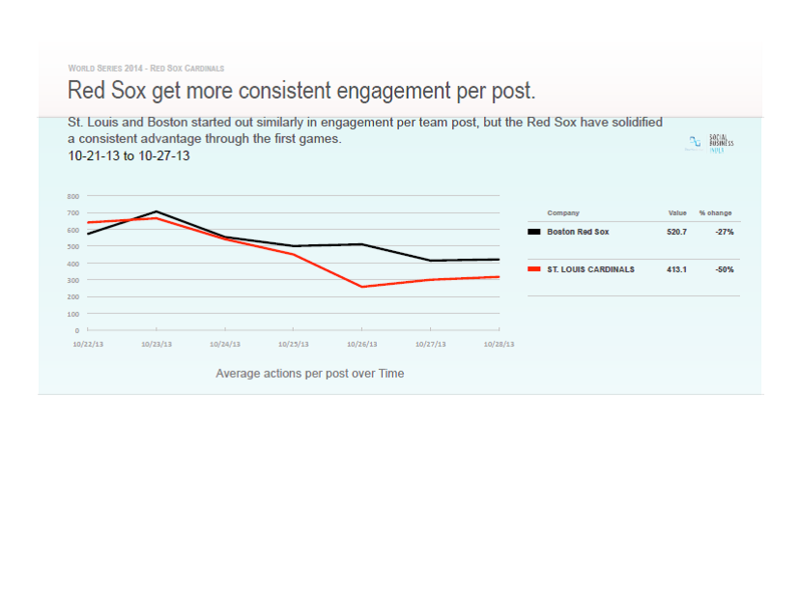 The Red Sox have one of the league’s top social media followings while the Cards are in the next tier. Together they are generating enormous amounts of usage of statistics that help team executives and sponsors better understand the intangibles of fan excitement, loyalty and togetherness. There is a global shift on towards collecting real-time analytics that provides a never before seen data flow look at fan metrics after dramatic situations and during rallies. Fan responses, reactions and sediments parallel game action every pitch, out and inning. Busch Stadium was plugged in at the end of game three expecting a win while Red Sox fans knew a rally was just a play away. RedSox Nation is a fan base that is Internet friendly. 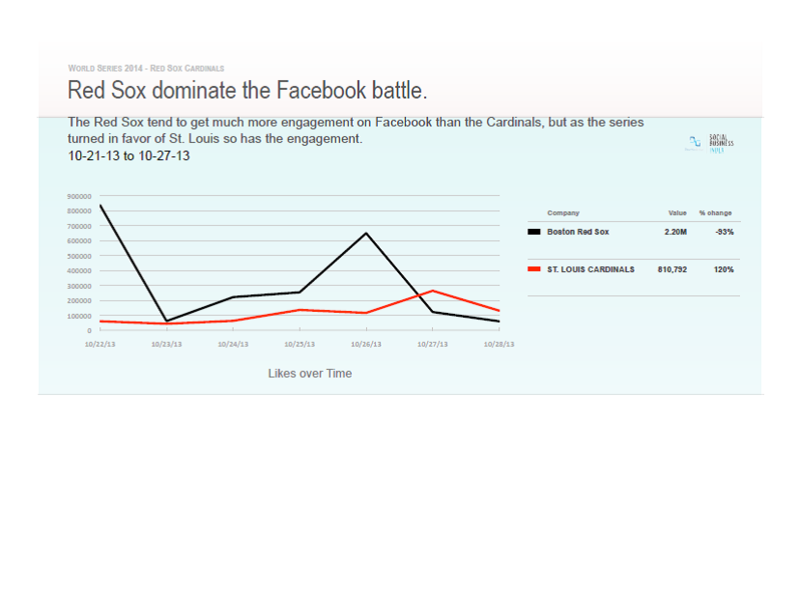 The measurable World Series engagement via the charts provided by the Dachis Group indicates that the Cardinals fans are close in most all platforms. A good start in the first few innings by the Cards on the way to an upset win in game five at Fenway Park in Boston could reawaken the Cardinals digital army. Boston Red Sox Nation is a fan base that is Internet friendly. 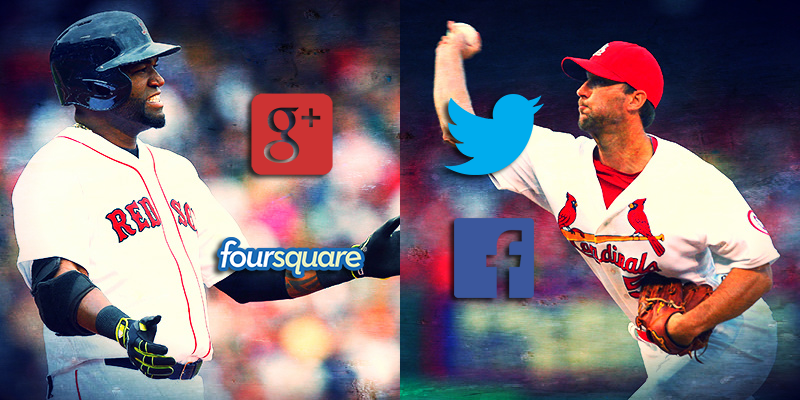 – The Red Sox continue to have a broader reach than St. Louis in social media. They saw 1.03 million social actions (likes, tweets etc.) vs 651,990 for St. Louis and consequently earned 61 million impressions in the last 48 hours vs. 35 million for the Cardinals. – As one might expect based on the on-field activity, there’s been a huge spike in positivity surrounding the Cardinals over the last few days with a 261% increase in very positive activity around St. Louis. – Meanwhile, there’s been a 50% increase in negativity surrounding the Red Sox – likely driven by controversial coaching decisions and the umpires’ ruling in game 3. Sports Techie, Over one million social actions after game three’s dramatic game ended “interference” call by ump Jeff Joyce represents a lot of happy and frustrated fans on both sides of the win and loss. The broadcast instant replay provided by Fox Sports supported the umps ruling, further exciting Cardinals and Red Sox fans. The MLB social media team was tweeting about the drama in real-time, representing both sides as best they could. All this social media havoc caused a major spike in traffic. 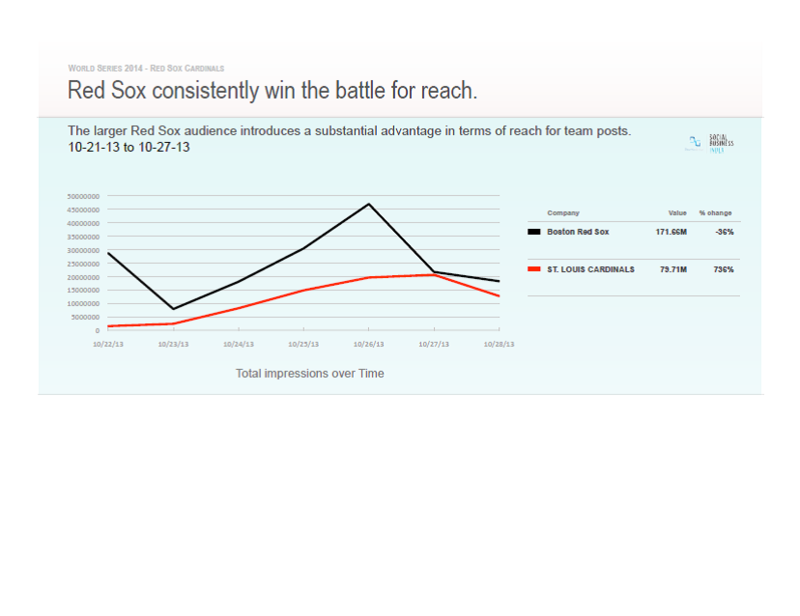 The impressions by Red Sox social media savvy fans are more than 2X the number of impressions that Cards fans produce. The fact that the Cardinals won game three is reflected by the flip of Red Sox very positive signs going down to 1,054 and the Cardinals very positive signs reversing up to 5,535. The Game 4 numbers have not been released yet but look for those to be released shortly. The Red Sox won game 4 to even the series at 2-2 ensuring the series heads back the Boston for game 6, tonight’s game 5 is on Fox. Ever increasing mobile device adoption by fans all over the planet are generating more and more social media driven activity that can be tracked and broken down to help understand and improve the fan experience. The second screen experience when watching most all sports is enhanced when integrated with the live event broadcast on your television, smartphone or tablet. These long-time MLB organizations have generations of fans who understand the history of the game and its constant ebb and flow over nine innings or more. Both fan bases are producing social media actions that outline game action and outcome as seen in the social media analytical charts of games 1, 2 and 3. Keep tweeting win or lose, like the MLB content on Facebook, use your Google accounts, and check in with Foursquare, to enhance your game experience especially if you have fantasy player in plays, and help represent your team, coaches and players in fan social media engagement. Get ready for a game five that will easily record more than 1 million impressions as fanatical and casual fans on each side drive the graphs up to levels we have not seen in a World Series. Be a good sport and root on your team no matter what the outcome.